Padmavati Ghoomar Song: Deepika Padukone Looks Breathtakingly Beautiful And Her Graceful Dance Is Just On Another Level! 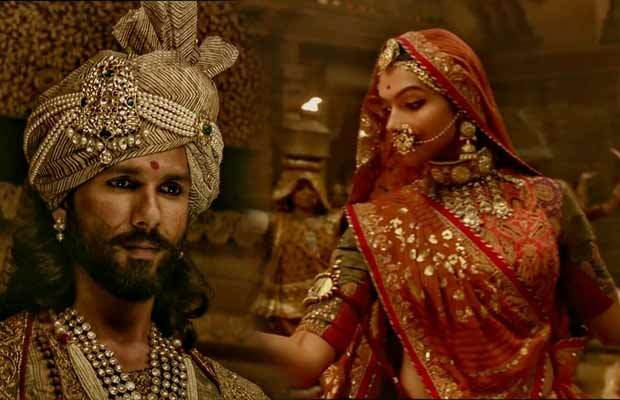 The first much-awaited song Ghoomar of Padmavati, starring Deepika Padukone, Ranveer Singh and Shahid Kapoor, is finally out. The song is sure to make you fall in love at first glimpse. Ghoomar has been composed by Bhansali and sung by Shreya Ghoshal. Choreographed by Kruti Mahesh Midya and Ghoomar training by Jyothi D Tommaar. Deepika looks gorgeous and graceful in the Rajasthani folk song. She makes a huge impression with just her expressions. The song is quite intoxicating. Everything about the song is so beautiful and grandeur that you can’t stop talking about it. The sets are magnificent and the scale enormous. Adding to that Deepika Padukone’s beauty and dance moves, you have a spectacular song on hand. Sanjay Leela Bhansali has carved each and every step perfectly. The twirls, the hand moments, the footwork, everything about Deepika’s graceful dance has left us awestruck. Ghoomar is a traditional dance form performed by princesses and queens of Rajasthan and its moves spell grace and elegance. Ghoomar is also performed by new brides when they are welcomed into their marital homes. Deepika Padukone will be seen in the titular role of Rani Padmini, Shahid Kapoor plays the role of Maharaja Ratan Singh and Ranveer Singh plays the role of Allaudin Khilji. Directed by Sanjay Leela Bhansali and Produced by Viacom18 Motion Pictures and Bhansali Productions, Padmavati is slated to release on 1st December 2017. Previous articleBigg Boss 11 Is Going To Have A Gossip Segment Called Big Buzz And Here Are Its Hosts! Next articleBigg Boss 11: Dhinchak Pooja BREAKS Down For This Reason- Watch Video!